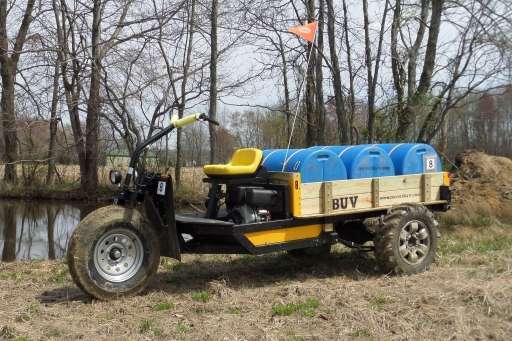 The Basic Utility Vehicle, (BUV), is designed for the rural geography of developing countries. It is a simple low-cost vehicle that is easy to operate, maintain and repair. It is designed for rugged terrain, and thus is ideal for serving rural Africa, allowing people to earn a livelihood and generate income. It has a 1,750 pound payload, can go 20 mph, gets 50 mpg, and it’s produced locally, costing $6,500. The BUV has many applications and can be tailored to meet specific community needs. The most common uses include a delivery truck, school bus, water/food transporter, and ambulance. There are also many options for agricultural implements for light tillage plowing, cultivating, planting, raking, and spreading fertilizer, plus transporting crops to market. The BUV is built in micro-factories across Africa, with the vision to empower people socially, economically, and spiritually. As a “Business as Mission” (BAM) enterprise, IBEC is privileged to provide consulting expertise. The BUV program uniquely addresses poverty by improving mobility of the poor, as the machine provides access to markets, medical services, and job opportunities. As all BAM businesses, Jesus is made known and lives are being transformed. Issah is a 30-year old man in Ghana. He was born a Muslim, and he raises yams and cassavas on a small farm, which supports several other family members. Pastor Mensah took an interest in Issah and helped him become a BUV driver, and he has been successful in establishing regular routes and customers. He has saved his money and used it to expand by hiring others to help on the farm and driving the BUV. All the while, Pastor Mensah had many conversations about Jesus with Issah, and now Issah is a follower of Jesus. As a result, he has joined the community of Christians. Issah is earning income, investing in his farm, planning to marry his girlfriend, and has committed his life to Christ. 3-4 more people will earn an income by working on Issah’s farm. Two boys are being paid for shoveling the sand into the BUV. The church receives a monthly gift from the earnings. The District Assembly and town chief receive royalties. The customers receiving the sand and gravel are able to accomplish their building projects by having the needed materials delivered (6-8 loads per day). This is BAM at its best – jobs are created, poverty is eased, and people come to faith in Christ. IBEC is proud to be associated with businesses like the BUV project.